Clarets boss Sean Dyche accepts his side were second best at Southampton. But he bemoaned another couple of refereeing decisions which went against his players. The Saints claimed a 3-1 victory at St Mary's, with two goals from former Claret Charlie Austin and one from Nathan Redmond, with Sam Vokes replying from the spot. But at 0-0, the Clarets were denied a cast-iron spot kick as Johann Berg Gudmundsson was upended by Virgil Van Dijk. Sam McQueen then won a soft penalty at 2-0, and even Mike Dean's decision to hand Burnley a spot kick at 3-0 down, was dubious. 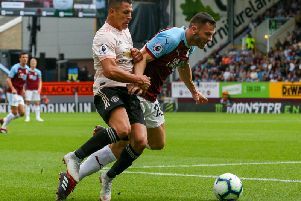 Dyche said: "On the day I thought they were too strong overall, after they had a really good first 12/15 minutes, I thought we got to grips with it a little bit then and slowed them down. "We had a couple of maybes ourselves, and then the big defining point is the penalty. "It's impossible it's not a penalty, simple as that. "We struggled two years ago to get decisions, and we're struggling so far this season. "The first game of the season against Swansea, impossible it's not given, and we all know what happened against Arsenal, then today. "I must make it clear, that doesn't take away from them being a good side and them giving a really good performance, and being too good for us on the day. "But that doesn't half make a difference, if you can get a foothold in the game away from home, presupposing we score it, you're 1-0 up and the whole feeling changes. "The stadium changes, the feeling in their team changes, our team grow from that, still searching for your first big performance and win away from home. "So that is a frustration. And I've seen their pen, and...wow...I don't know where it lives any more, penalties like that in this game. "Ours is then a soft one, theirs is incredibly soft. It's beyond me, simulation possibly it's called. "It's really important you make it clear though, I don't do excuses, they generally throughout the game were stronger, sharper, their awareness of their shape against ours was better, and they've got a group of players who've been put together for a lot of money, and that shows sometimes. "You just hope decisions balance out." Southampton had a Premier League seasonal high 34 shots at goal, with Tom Heaton's heroics not quite enough, but Dyche countered: "I wasn't really disappointed (with the chances we gave away) until the first two goals, from two corners. "They created good chances and Tom has to be right on his guard and played well to make sure it's a more respectable situation. "But if the game is tight, we wouldn't have opened up like that. It's hard to always find the margins when a performance pans out like that." One Heaton save, to deny an Austin header, was as good as you will see, though Dyche joked: "I reminded a couple of people earlier, he's an England international you know, he's got a job to do and he is allowed to do it, and he's done it very well. "Gordon Banks (pulled off a better save)...Joe Hart the other night...I don't want to do Tom down, but he'll get a big head!" But Dyche was disappointed with shipping two goals from corners: "Generally speaking, it's unusual for Tom to have to do that much work, we're opening up, chasing the game, and that can happen. "The thing I question most is the set pieces - it's not like us. two pretty soft ones, a bit of fortune on the first, and the second goes through someone's legs. "But generally we dealt with that reallly well, and I put that down to a one-off because that's not like us. "I know we can do better, good planning doesn't always work. There's a desire here to go and defend, and I didn't think we showed that on the two set pieces. "Ben falls into Vokesy on the first one, so his man gets a free header, and the second goes through Aiden O'Neill's legs, though it's a great striike. We're attacking the ball and sometimes it goes in the right slot, but it's always disappointing as a manager to lose goals to set pieces."